On these pages I will present a little information about interfaces for the dive computer 'Aladin' from Uwatec (now part of Scubapro). A lot of the material is about 15 years old but I recently (2013) made a new version that prompted a massive cleanup of this section of my website. Most of the stuff was irrelevant since recent dive computers have a much larger memory, making antiques like the MemoMouse obsolete. But there may be a few old-skool divers with an Aladin on their wrist. After all, if it works, don't fix it! I used this interface for many years, but the major problem is that recent PCs don't have RS232 ports anymore. In order to have this working one would have to use a RS232-USB converter, which in theory would work. Except it doesn't, reliably at least. 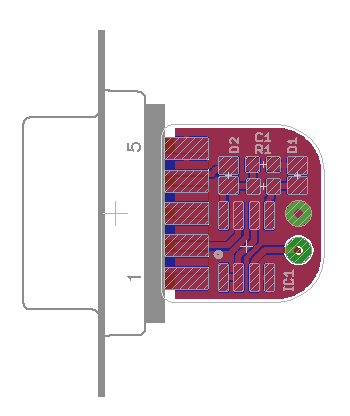 The curlpit lies in supply rails: your off-the-shelf USB-RS232 converter may not give you a clean +/12V. Instead, you'll be lucky to even get a negative voltage rail. The result is that the above circuit works can upload your profiles to your PC about 10% of the time. Ouch. To fix this we first use an LM358 instead of a uA741. 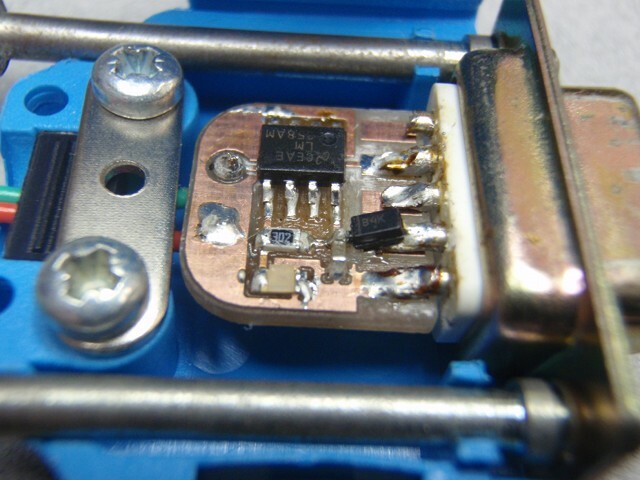 Next we use an old suggestion Steffen Klupsch: replace the 1N4148 diode with an LED. This has two advantages.  First, the threshold voltage of the comparator can be set to about 1.5V by setting the current in the LED with its series resistor. The current/voltage curve depends on the LED; I used 3K for my LED but YMMV. 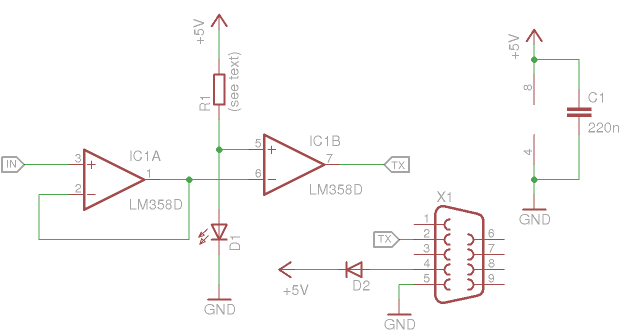 Next, the LED provides a nice way to tell if your circuit is powered. This may look trivial, but RS232/USB converters or (recent) RS232 interfaces don't actually set the DTR line high before data is sent. Thus you may have to send a couple of characters on the interface to 'hot-wire' your interface before launching your dive log software. and the LED lights up showing the interface is ready. I have been using SMD exclusively for about 10 years now so the PCB I propose here is rather compact. It can fit within a DSUB-9 shell easily. 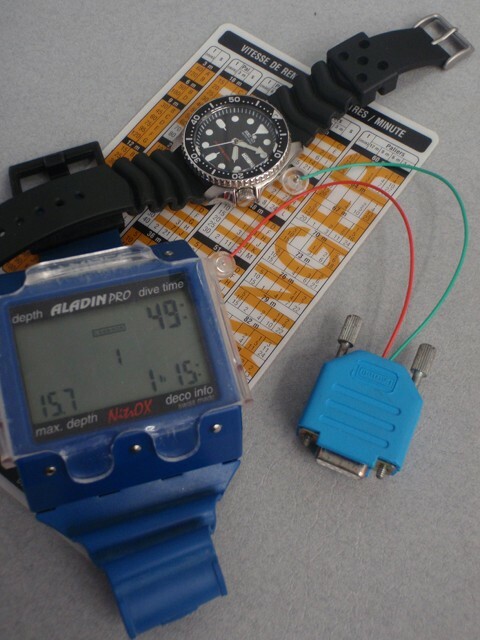 Remember to keep the wires between the Aladin and the PCB very short (10cm max) to avoid excessive capacitance.  The classic bi-directional interface comes from Christoph Korber and was widely spread by Matthias Heinrichs. It has a few problems that I discuss in a separate page. A couple of documents describing the transfer protocol of the Aladin can be found here, here, here, and here. when the computer is idle, it sends a 100Hz +/-3V square signal on the black port. 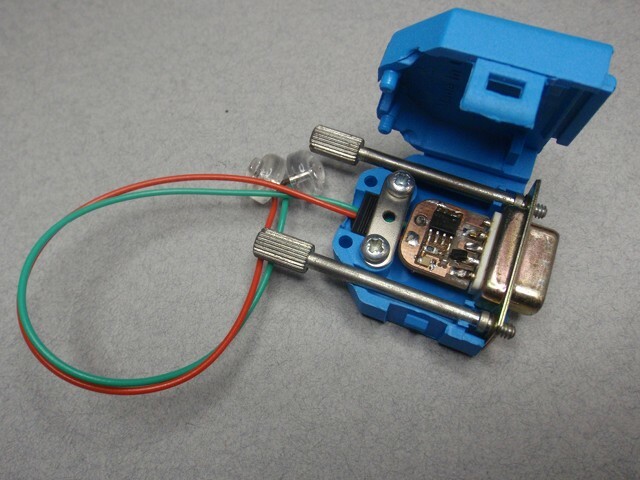 This is used to trigger the different functions when shorting the contacts with your fingers. before the computer enters divelog mode, the logbook information is sent as a 0V/+3V square signal. the Aladin then enters the divelog mode. This behavior is illustrated on the figure below. Note that when you enter the divelog mode, the Aladin holds for a short time: that is when the info is sent. Finally, the impedance of the Aladin port is about 1M when it drives the line, which explains why short wires are essential.